Servos are ideal for embedded electronics applications because they do one thing very well that motors cannot – they can move to a position accurately. 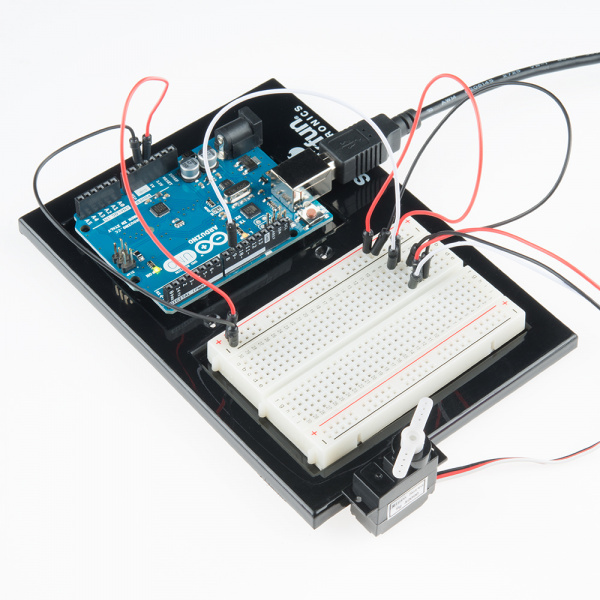 By varying the pulse width of the output voltage to a servo, you can move a servo to a specific position. For example, a pulse of 1.5 milliseconds will move the servo 90 degrees. 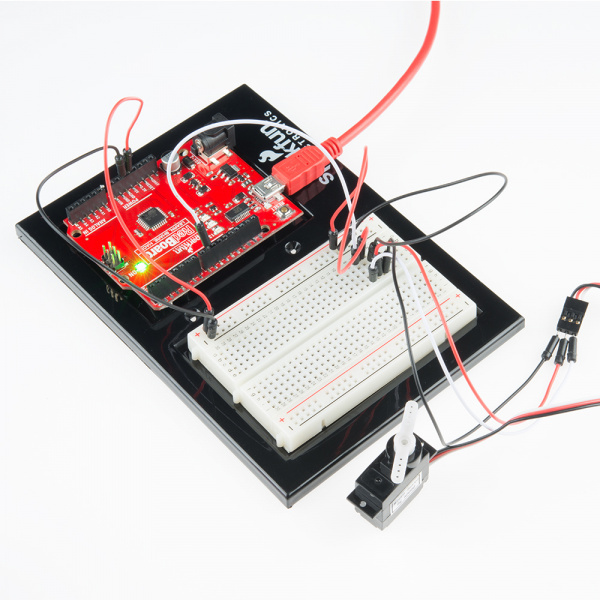 In this circuit, you’ll learn how to use PWM (pulse width modulation) to control and rotate a servo. Connect 3x jumper wires to the female 3 pin header on the servo. This will make it easier to breadboard the servo. Open Up the Arduino IDE software on your computer. Coding in the Arduino language will control your circuit. Open the code for Circuit 08 by accessing the “SIK Guide Code” you downloaded and placed into your “Examples” folder earlier. Sweep a servo back and forth through its full range of motion. 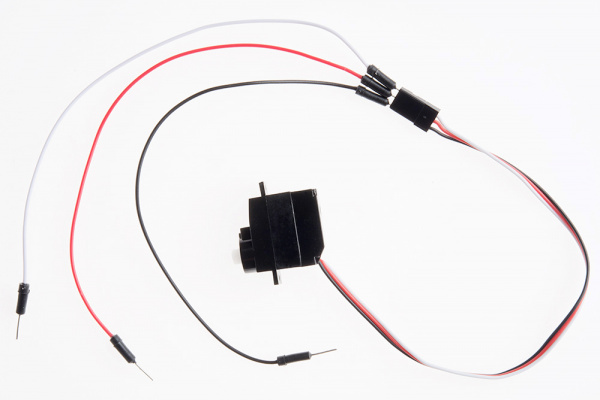 The servo has a cable attached to it with three wires. jumper wires directly into the socket. // hard work for you. We're going to include a "library"
// that has the functions needed to drive servos. // create one of these for each servo you want to control. // pins 9 and 10! #include is a special "preprocessor" command that inserts a library (or any other file) into your sketch. You can type this command yourself, or choose an installed library from the "sketch / import library" menu. The servo library adds new commands that let you control a servo. 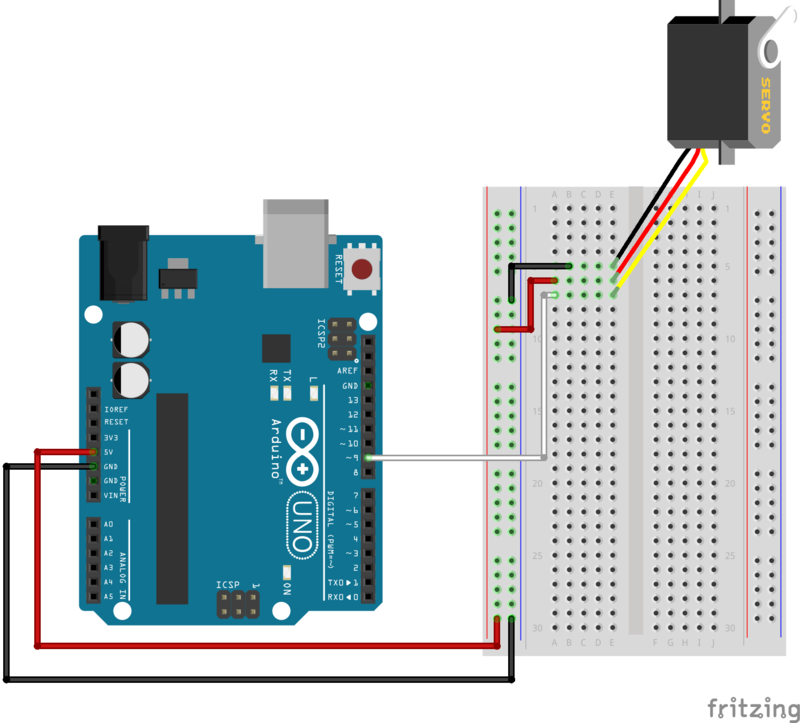 To prepare the Arduino to control a servo, you must first create a Servo "object" for each servo (here we've named it "servo1"), and then "attach" it to a digital pin (here we're using pin 9). The servos in this kit don't spin all the way around, but they can be commanded to move to a specific position. We use the servo library's write() command to move a servo to a specified number of degrees(0 to 180). Remember that the servo requires time to move, so give it a short delay() if necessary. You should see your servo motor move to various locations at several speeds. If the motor doesn't move, check your connections and make sure you have verified and uploaded the code, or see the troubleshooting section. Robotic arms you might see in an assembly line or sci-fi movie probably have servos in them. Even with colored wires it is still shockingly easy to plug a servo in backward. This might be the case. A mistake we made a time or two was simply forgetting to connect the power (red and black wires) to +5 volts and ground. If the servo begins moving then twitches, and there's a flashing light on your RedBoard or Arduino Uno R3, the power supply you are using is not quite up to the challenge. Using a wall adapter instead of USB should solve this problem.